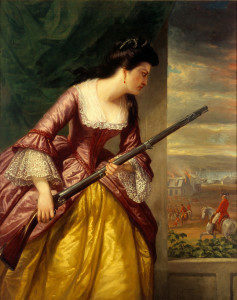 This painting of Abigail Hinman is on display at the Lyman Allyn Art Museum in New London, Connecticut. The story of the painting is that Abigail was home in New London while her husband, a sea captain, was away on a voyage. Suddenly, outside of her home, Abigail heard a commotion and witnessed the city of New London being destroyed by red-coated soldiers. Surprisingly, she saw Benedict Arnold, a family friend from the nearby town of Norwich, was one of the soldiers. He commanded the soldiers to spare her property, but Abigail was not blind to his blatant act of treason. (Daniel Huntington (1816-1906) this link shows other paintings by the same artist). Ask students why the image of Abigail is so different from the other subjects in the the paintings.